Eczema is an inherited, chronic skin condition that usually appears during childhood. It is thought to be caused by a person’s inability to repair damage to the skin barrier, which causes the skin to lose moisture and become dry and scaly. Red, dry, patches of skin that may appear scaly. Eczema can occur anywhere on the body, with the most common areas being the front of elbows, the backs of knees and the scalp. One of the most common places for the inflamed, itchy, dry skin of eczema to develop is on the scalp and the most common type of scalp eczema is known as seborrhoeic dermatitis, however other skin conditions, such as psoriasis, allergic contact dermatitis (inflammation caused by an allergic reaction to a certain substance), or atopic eczema (which often occurs in those with asthma and seasonal allergies), may cause symptoms similar to those of scalp eczema, notably an itchy scalp. Seborrhoeic dermatitis is probably caused by overproduction of sebum, the natural oils secreted by sebaceous glands in the scalp. The greasy scales that can result may encourage the overgrowth of a normal skin fungus, called Mallasezia, which may, in turn, worsen the dandruff like symptoms. What actually triggers the irritation of the scalp isn’t understood, but it’s thought that changes in the weather, stress, and family history can all play a role. 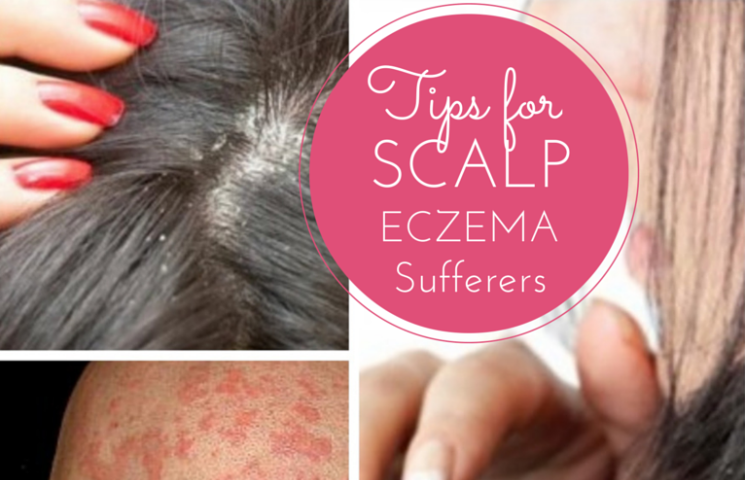 Last month, a survey our online community revealed that there are in fact quite a large number of you suffering from the symptoms of scalp eczema. According to our respondents the relentless itch and pain from scalp Eczema makes it an uncomfortable and often embarrassing condition to live with and whilst there is no over-night miracle cure to rid you of this condition forever, it is possible to keep symptoms under control and at a minimum. So save yourself the time and money (trying different treatments can prove very costly) and stop searching for the one-hit wonder that will rid you of the itch, and instead focus on implementing a treatment and maintenance plan to help keep your symptoms at bay. If you know you have allergies then you’ll already be doing your best to avoid the triggers, but if you don’t know then research your family history for allergies then go your GP to get tested for allergies – and learn how to recognise the triggers and control the symptoms. Wash your scalp (and the rest of your body too if you have eczema in other areas) in lukewarm water as hot water can exacerbate symptoms. Similarly, avoid washing the affected skin too regularly – every other day is preferable to daily as water can cause the skin to dry out even more. Strongly scented shampoo will irritate and dry out your already sensitive skin. Instead opt for gentle, natural, soap-free products for your skin and scalp. And shampoo your hair after you’ve been sweating heavily, such as after a workout, because perspiration can be a trigger. When drying your head use the towel to pat it dry, rather than rubbing it. As tempting as it can be to give your scalp a good scratch with a sharp comb or brush, the relief if will bring will be short lived, and can actually end up causing further more serious damage to the skin on your scalp. Invest instead on a soft bristled brush that can help to remove the flakes of skin from the hair shaft without making the scalp eczema worse. For the same reasons outlined above, it is preferable to keep your fingernails short to minimise damage to the skin from scratching. Fingernails can harbour germs too, which can be easily transferred to inflamed broken skin, which will only make the eczema more uncomfortable and painful. The heat from hairdryers, curling tongs, hair-straightening irons etc, can cause the loss of moisture from already dry, damaged skin. Keep heat styling of your hair to a minimum. Moisturise the scalp and allow the hair to dry naturally whenever possible. Scalp eczema often responds to treatment, but it also often returns. Be on the lookout for signs of a flare-up, and start treatment right away. Our online community revealed they had tried all sorts of anti-dandruff shampoo’s to control the irritation and itchy scalp but many stated that nothing seemed to work and were desperate to find a product that would! COCO-SCALP is a unique ointment formulation – not a shampoo – that is designed to shift the scale and relieve the itch. It’s applied to the affected areas of the scalp and left on for one hour. This allows maximum medicine contact time for COCO-SCALP to break down the scale, and treat the skin below. The special scalp formulation of salicylic acid (to remove scale) and Coconut Oil (to moisturise, soothe and condition the skin and hair) provides the relief that sufferers are searching for. For treatment of Scalp Eczema apply COCO-SCALP daily for 3-7 days until improvement has been achieved. Thereafter intermittent repeated applications may be necessary to maintain improvement. Whilst an hour treatment time may sound a little too long to fit into a busy schedule, it really just requires a little planning. What other ‘treatment or repair’ routines do you fit into your week? Maybe a mani-pedi, a good book in a bubble bath, a face masks, or exercise? Prioritise taking care of your scalp condition in the same way – you could even combine the treatment with one of your other activities. There is no reason why you can’t take your hour me-time snuggled in a comfy chair with a book, or watch your favourite TV show with the COCOSCALP treatment on. Editors note: For those of you caring for significant others suffering from Scalp Eczema…my husband has Scalp Dermatitis and usually applies COCO-SCALP treatment before mowing the lawn, or settling down to watch his favourite sport on TV, then takes a shower to wash it out. That’s as much planning as it takes! You can read the full results and comments resulting from the trials here.